Much-loved: Fr Ray Kearney and a faithful friend. IT was a conversation in the priest’s carport in Sunnybank parish, on Brisbane’s southside, that changed the trajectory of my life. The then parish priest and my former employer Fr Ray Kearney, who died on October 29, spoke candidly of how he saw a difficult decision that lay ahead of me. “God doesn’t want this for your life, Selina,” I remember him saying, as clearly today as he did more than a decade ago. 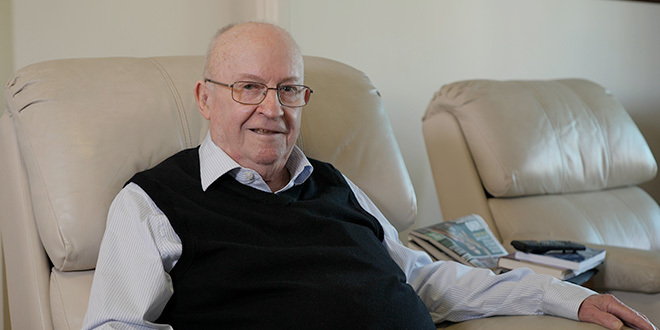 He invited me inside the presbytery and the candid conversation continued, in the empathetic tone I’d become so accustomed to and on the dated armchairs that had welcomed me, and all other staff, parishioners and visitors since his arrival from Booval parish in 2001. Indeed, this gentle, reserved and endearingly humorous man, was more than a parish priest and employer. He was a confidante, a role model of compassion, and ultimately, as all priests should be in word, action, thought and prayer, of Christ Himself. Throughout my employment as sacramental co-ordinator from 2000 to 2009 in Sunnybank, of which he was pastor until 2010, I knew his prayers were assured, as was his confidence in my abilities, even before I understood them, and that the door of the presbytery, and indeed his heart, was always open. 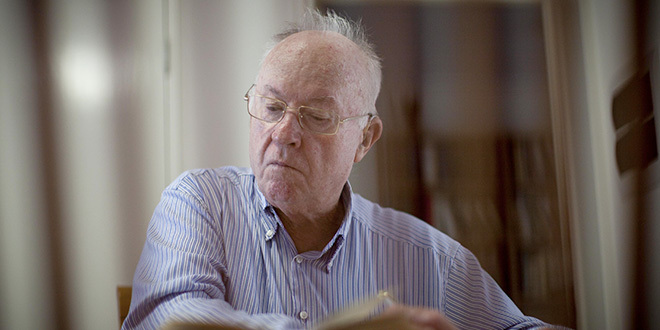 Life-long student: Fr Ray Kearney. Former parish secretary Moyra Carroll worked with Fr Ray from his arrival until mid-2005, remembering “a kind, compassionate, understanding and non-judgemental man”. “Fr Ray was a gentle man with strong family values. His kindness extended not only to me but to my children and grandchildren as well, and for this I will always be grateful,” she said. Gabby Nelson worked in an administrative capacity and was encouraged by Fr Ray to lead Christian meditation in the parish when she knew “nothing about it”, remaining indebted to his trust in her capabilities and his compassionate ways. “I was extremely concerned and upset about a family member’s mental health diagnosis,” she said. “(And) Fr Ray took the time to listen and to share openly about his experience with a similar situation in such a way that I felt I was strengthened to deal with what was to come. Karen Praeger recalled Fr Ray’s compassion at the death of her father, only weeks after she began working in parish finances. “Dad wasn’t a Catholic but my family was brought up in the Catholic faith (and we wondered) where would his funeral be held,” she said. “Fr Ray sat me down and said, ‘But here (Our Lady of Lourdes), of course’. My family are very grateful for what he did that day and then again eight months later when Mum passed away. Youth co-ordinators from 2001 to 2003, Damian and Susan Gambley also attest to Fr Ray’s trust in their abilities. 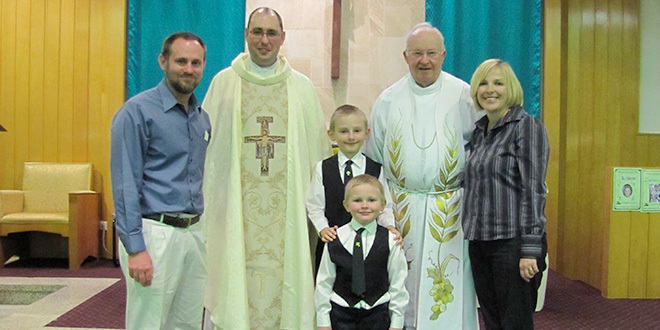 Guiding pastor: Fr Ray Kearney with Fr Adrian Sharp, Damian and Susan Gambley, and their sons Joshua and Aaron (front) after the boys’ First Holy Communion Mass in 2010. The Gambleys were also inspired by how their pastor lived his faith and how he continued the commitment to youth and young adults shown by former parish priest Fr Tom Hegarty. A particularly fond memory was of the eve of welcoming their eldest son into the world, when Fr Ray blessed Susan at the end of the Sunday-night Youth Mass and she went on to have “a textbook labour” within 24 hours. Youth co-ordinators following the Gambleys, Steven and Eloise Bird, have a myriad of stories about the man who was more than a pastor. Steven was employed first in 2006, aged 19, “with not much life experience and with big shoes to fill”, he said. On Steven’s return from World Youth Day in Sydney, he was considering leaving the role but Fr Ray “knew better” and enlisted the help of a favourite companion Yinnie, a shih tzu (dog) adored by all the staff and with an incredible understanding of the comings and goings of the Mass. Absolute trust: Fr Rey Kearney had an unwavering conviction in the providence of God. “Sitting in his office with Fr Ray and Yinnie, he mentioned that Yinnie had been offering her nightly rosaries for me,” Steven said, adding, “(And) how could I say no to that? Steven recently asked Fr Ray about the risk of employing him “at such a young age”. “Fr Ray said, ‘No risk at all, Steven, the Holy Spirit was guiding us all along’,” he said. Kristen Roe, employed as Brisbane South Deanery youth co-ordinator from 2008 to 2012, worked closely with Fr Ray who was dean, saying, “He was always encouraging”. “I was always on the go and I remember, when I ran a retreat day a few days after my third son was born, Fr Ray made a point of telling me I needed to have a good rest afterwards,” she said. Former principal of Our Lady of Lourdes Primary School, Sunnybank, Gerry de Ruyter described the decade of working with Fr Ray, from 2001, as “an absolute privilege and honour”. “For me, it was his humbleness, gentleness and the way he spoke to people that inspired me the most,” Gerry said. Fr Ray was always pleased to visit the newly renovated Our Lady of Lourdes Church, Gerry noting he’d comment “on the great job he thought (current parish priest) Fr Dan Ryan, or ‘Danny’ as he called him, was doing”. Verna Sharp, mother of Annerley Ekibin priest Fr Adrian Sharp, “holds dear” a kindness Fr Ray showed while in his former parish of Booval, after her son’s ordination and when Fr Sharp was appointed there as associate pastor. Verna, a Sunnybank parishioner, made many priestly vestments for Fr Ray and collaborated with him and others on the parish liturgy committee. Giving pastor: Fr Ray Kearney with members of the East Timorese group in Sunnybank parish including Margaret Fitzsimmons (third from right) and a special stole made by Verna Sharp. 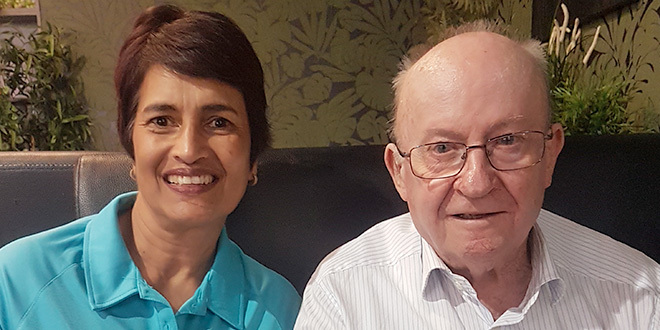 Our Lady of Lourdes parish manager Karrin Halliday said she enjoyed working with Fr Ray for the three years that their time in Sunnybank overlapped and he often went above and beyond his role, ensuring their friendship was long-lasting. “When he cooked pasta for himself at lunch I would get a phone call to ask how many were in the office, and half an hour later I was collecting bowls full of pasta to share with those who were working that day,” she said. 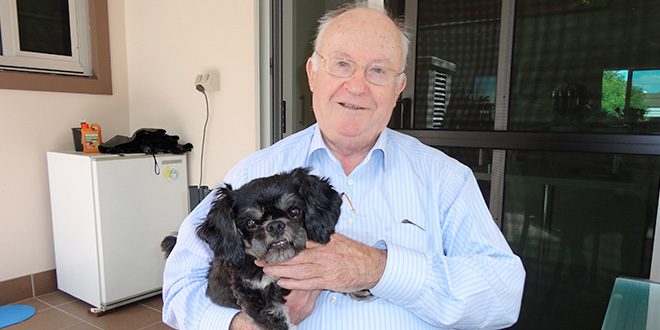 Helping with his move from Sunnybank, into retirement, Karrin was involved with Fr Ray acquiring a new canine companion, Ching, when Yinnie died, while his “passion for Rome” inspired her and husband Paul to travel there. The staff with particularly unique ties to Fr Ray are his former and longest-serving housekeepers. Also working for Fr Hegarty, Margaret Fitzsimmons said she “learnt a few things” from Fr Ray, who refined his love for cooking while living and studying in Italy, “like how to grill fish and cook steak”. “Fr Ray was a great cook,” she said. “(And) he was always very supportive in what we did in the parish, too, like when Peter, my husband, and I started a group for the East Timorese and Fr Ray let us use the office for that work. On his annual holidays, Fr Ray kept parish staff in mind, Margaret saying, “He always brought back some gifts” and she treasures them. Twins Elizabeth Howkins and Isabella Sherrie said they were “privileged to work with Fr Ray” as housekeepers. It was Fr Ray as “father figure” that housekeeper from 2005, to his retirement in South Brisbane and up until his passing, Therese Prygiel, will miss the most. “Fr Ray was always there for me,” she said. Father figure: His housekeeper from 2005 until this year, Therese Prygiel, with Fr Ray Kearney in 2017. “At his core, he exuded the Gospel message of love. He had a strong conviction in building relationships of love with God, the Church and our fellow neighbour. 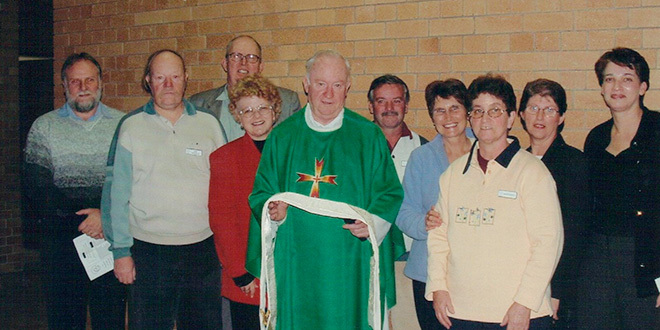 The former and current staff of Our Lady of Lourdes, like those in Booval parish, will each hold onto our own memories of Fr Ray as the gentle man, trusting pastor, loyal confidante and loving father figure that he was. As Christmas approaches, a time when he gave thanks for the achievements of the year at a lively staff gathering in Paloma (Reception Centre), we will particularly cherish his memory. Vale Fr Ray, your presence made our collective work and ministry in Sunnybank parish not work at all. As one last favour, if you can do something about Margaret sharing your tips for cooking the perfect steak, I’d be most grateful. I’d match it with a good red and say, “Salute”, until we meet again.